FILE - Jean-Pierre Lacroix, U.N. undersecretary-general for peacekeeping operations, sits for an interview with Reuters in Brasilia, Brazil, Nov. 27, 2017. The U.N. peacekeeping chief urged Mali's government Tuesday to do everything possible to hold presidential elections on schedule in mid-July. Jean-Pierre Lacroix told the Security Council that last week's adoption of a timeline for the government, Tuareg separatists and armed groups to implement a June 2015 peace agreement by the end of March was an important step. He said this should lead to progress on a host of issues, including reforming the security sector and establishing security conditions for the presidential vote as well as local and regional elections in April. "It's urgent that we confront the fact that we're racing against time in Mali," Lacroix said. "We are confronting increasing insecurity which has cost the lives, unfortunately, of hundreds of civilians in the north and center of the country as well as dozens of elements of defense forces" from Mali, the U.N. and France. Mali has been in turmoil since a 2012 uprising prompted mutinous soldiers to overthrow the country's president of a decade. The power vacuum that was created ultimately led to an Islamic insurgency and a French-led war that ousted the jihadists from power in 2013. But insurgents remain active in the region. Lacroix said 4.1 million Malians — or 22 percent of the West African nation's population — would be "food insecure" this year. "The goal needs to be to create conditions that would lead to elections, and beyond that pursuit of the peace process," he said. 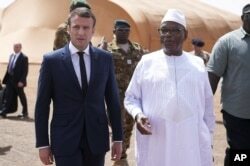 FILE - French President Emmanuel Macron, left, talks to Mali's President Ibrahim Boubacar Keita as they meet French soldiers of Operation Barkhane, France's largest overseas military operation, in northern Mali, May 19, 2017. Lacroix said presidential elections "will mark the beginning of a new chapter in the stabilization of Mali." "Its establishment represents an important step forward in the implementation of the justice and reconciliation measures of the [peace] agreement as well as in efforts to fight impunity," the undersecretary-general for peacekeeping said. Lacroix also announced a "comprehensive strategic review" of the more than 11,000-strong U.N. peacekeeping mission in Mali, which has become the most dangerous in the world for peacekeepers. He said it was time to reassess "the assumptions that underpin" its presence, review its tasks mandated by the Security Council against its achievements, and re-examine its deployments. Mali's Foreign Minister Tieman Hubert Coulubaly said the government was committed to progress, which he said "has contributed to the progressive restoration of peace and security in our country." However, he said, "time is running short," and the government is determined to accelerate implementation of the peace agreement. In 2018, Coulubaly said, the government is committed to completing the implementation of the peace agreement, "increasing insecurity in the center of the country," meeting demands "for urgent social needs," and "organizing credible, transparent and peaceful elections."